With his genre-changing series Buffy the Vampire Slayer, Joss Whedon shaped the face of television in the 1990s. Nearly 20 years on, having written and directed 2012’s The Avengers, which became the third highest grossing film worldwide, he now plays a key role in the creative direction of the Marvel Cinematic Universe. The time is ripe for biographies and publishers have not demurred. 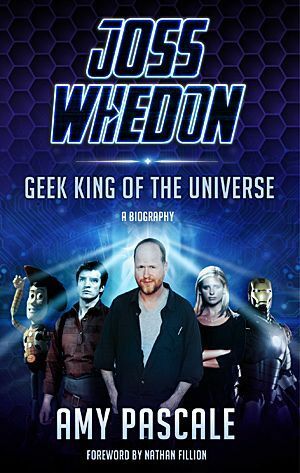 Granted generous interview access to Whedon and his collaborators, Amy Pascale offers a compelling narrative through Whedon’s private life and creative endeavours to explain his success. Fittingly, a large number of the chapters chronicle Buffy, the feminist icon that put him on the televisual map, with the story continuing until TV spin-off Marvel’s Agents of S.H.I.E.L.D. hit the airwaves in autumn 2013, and including critical insight and eyebrow-raising factoids along the way. It emerges that Whedon’s power resides in a lifelong love of story, forging strong bonds with his actors, crew and fans, and a commitment to each project that was, in the beginning, described as looking for ‘the Buffy of it’. While Pascale at times oversimplifies the narrative in the service of giving shape to Whedon’s career, she sticks close to ‘the Whedon of it’, searching for his ineffable quality. Her willingness to delve into why some of his creations have been less successful than others lends the biography a refreshing candidness. As a companion to the many academic publications on his work, one could not do better than Pascale’s consideration. This entertaining read will leave fans reaching for their Buffy DVD box sets.